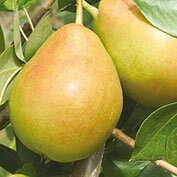 Crisp 'n Sweet Pear Tree | Gurney's Seed & Nursery Co. Imagine the juiciness and rich sweet flavor of a traditional European pear coupled with the downright addictive crispness of an Asian pear, and you have Crisp 'n Sweet! 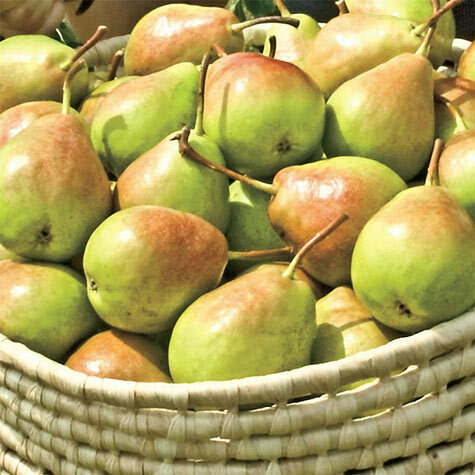 You'll never find such taste and texture combination in any other pear! As if its eating quality were not enough, Crisp 'n Sweet is a breeze to grow—trees have a high resistance to fire blight. Blooms are frost tolerant so you are virtually guaranteed a large harvest each year, and, unlike many pears, Crisp 'n Sweet ripens to perfection on the tree. No more guesswork, just pick the fruit fresh from the tree mid August and discover the delicious difference of Crisp 'n Sweet! Zones 5-7. Green Jade cultivar. PP14034. Height: Standard: 20-25 feet. Semi-dwarf: 12-15 feet. Spacing: Standard: 20-25 feet. Semi-dwarf: 12-15 feet. Spread: Standard: 15-25 feet. Semi-dwarf: 8-12 feet. Pollinator: Maxine, Honeysweet, Korean Giant pear. Blooms: Mid-season - blooms are frost tolerant so you are virtually guaranteed a large harvest every year. Fruit: Very large in size and sweet perfumed. Flower Form: Small white blossoms. 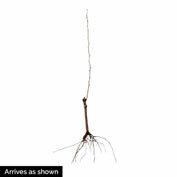 Soil Requirements: Well-drained, deep soil that is reasonably fertile. Comments: Tree is very productive and has excellent tolerance to Spring frost. Fruit thinning is required (remove fruit to one per cluster at fruit set) and it will not have premature fruit drop.